This is a microsite of the University of Pécs, Faculty of Business. 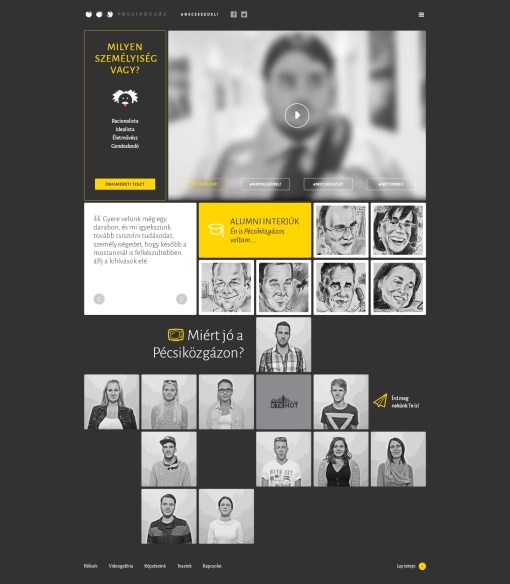 It is an interactive portfolio site, where you can find videos and informations about their campaign. 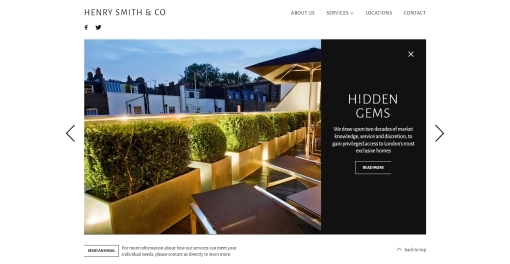 Henry Smith & Co is an exclusive real estate search and acquisition consultancy, offering services in the prime central London market. Our independent service sources and secures exceptional properties in the most desirable areas of London for high net worth individuals, international investors and corporate clients. Whether you are looking for a luxury family home, a high yielding investment, the perfect building plot or simply a new development project, we have the experience and access within the real estate sector to help you make the right choice. 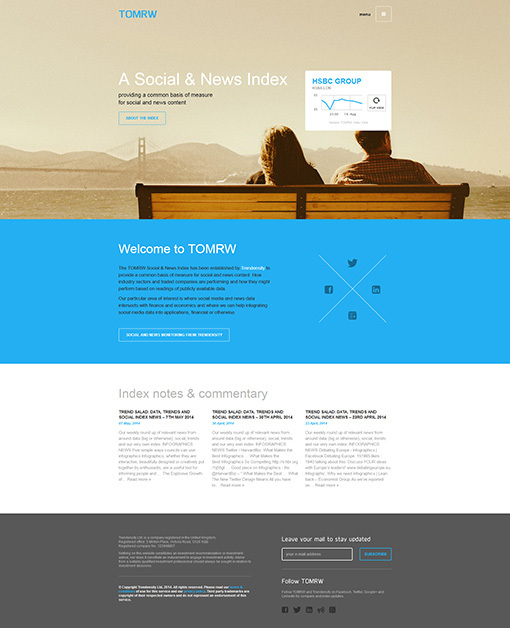 The TOMRW Social & News Index has been established by Trendensity to provide a common basis of measure for social and news content. How industry sectors and traded companies are performing and how they might perform based on readings of publicly available data. Our particular area of interest is where social media and news data intersects with finance and economics and where we can help integrating social media data into applications, financial or otherwise. Trendensity is a data dashboard service, providing social and news media insight. PECSbook is a non-profit association. Its goal to create a book from the pictures and opinions, which are uploaded on the Facebook page. This book shows the city of Pécs from an other view, with the technic of the new epoch. We created this Facebook page, an interactive area, where with the community of Pécs we can edit the PÉCSbook. Every opinions appear, every opinions is important. We would like to collect and display the interesting photos of Pécs. The project is non-profit, everybody can buy the issue, while stock last. The publisher of the book is the Foundation for Heartsick Children. The purchaser of the book supports the foundation. Aquaprod Ltd. is the only one in Hungary who has 15 years experience in the field of high- and super high pressure water technology. The result of its strategy that they supply the commercial representation of the world's leading manufacturers of water technology. At the project of gepszer.hu and aquaprod.hu we needed to create a common brand that appears with unique solutions and identity, because of this the two sites are really similar. 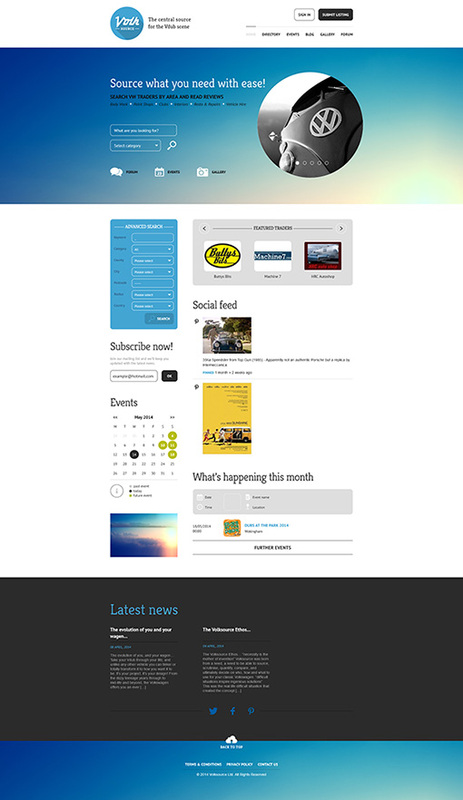 The responsive sites become the modern face of the company. “necessity is the mother of invention” Volksource was born from a need, a need to be able to source, scrutinise, quantify, compare, and ultimately decide on who, how and what to use for your classic Volkswagen. “difficult situations inspire ingenious solutions” This was the real life difficult situation that created the concept for Volksource - one main central hub to help you and to help your Volkswagen stay alive. The LAT-SAT Ltd. founded at 6th of November, 1990. Its activities are planning, building and operating of cable television networks, and distribution of related products of antennatechnic and satellite reception. On the web page you can find according the zip code the offers of company in the topic of internet, television and phone. In addition, online administration, public information service helps serve out the consumers. 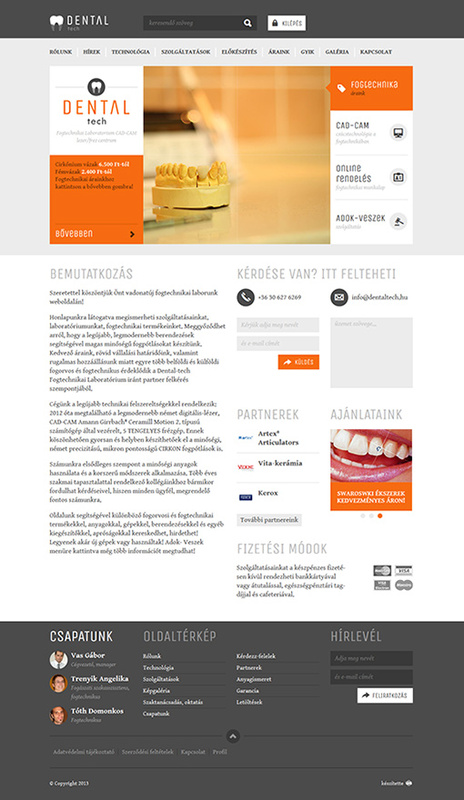 For the newest dental laboratory and CAD-CAM centre in Pécs, we developed a modern, responsive, portfolio site by which, beside the presentation of the products and services, users are allowed to fill the dental worksheet online, in case of online order. Despite Dentaltech is our 5-6th dentistry related project in 2013, all of them posed compeletely new challenges. On the dental technology page, the information had to be presented transparently and aesthetically, while we had to provide friendly environment for registered online orderers. Since the site has been translated into 4 language, we gave priority to mobile optimization. We felt that a modern dental lab requires a modern website. Therefore the design was made with extra care in order to fulfill the demands of the responsivity. Beside the design, we developed a software with usual functions and an online dental worksheet resembling the paper ones used in practise. By the end of the project, the basic concept has been modified a couple of times, therefore severel additional function has been added to the administrative interface. Technically, we created a 100% responsive site where all the pages have three different views for the different browsing devices. Da Vinci Private Clinics is one of the most exclusive private hospital of Hungary. The praxis of noted specialists from the Medical Faculty of the towns university is above Pécs, in a modern building with great panorama, creating unique options to its patients. 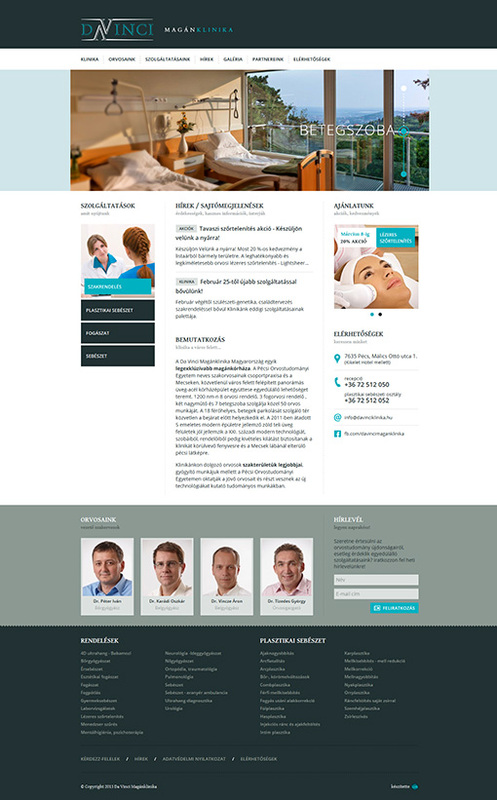 Based on the expectations, we had to create a unique clear image wich highlights the exclusivity of the clinic and provides the large amount of content logically and permeable. It was also important, that there would be something "extra" on the site wich differentiate it from the competitors. The first task was to structure the large amount of information wich defined the wireframe and the first visualisation. We created a gaphically modern, clear atmosphere with a large slyder. Among several concepts, we have chosen to allow visitors a sort of admittance to the clinic. The site received positive reception from both our customers and visitors. The informations are easily accessible even without a searc hengine programme. The site incorporated into the company's everyday operations extending the informational and customer service channels. On their growing areas in Tokaj, Villány and Somló, Zsiray Winery has been working on producing authentic hungaricums for years now. The objective of their website is to present the available wines and to provide information about the wine regions, the process of wine making and their presence in related events. We considered Zsiray Winery as a special task, because we always wished to work with a winery. Since there is an option to order products from the site, it was a particular challenge to feature aesthetically the otherwise thin bottles on the site and ensuring transparent content at the same time. The customer's basic expectation was to create a clear, minimal style website supported with our creativity. The most important matter was to highlight the wines for which we have suggested a pageable solution by which the core products could be presented; in addition we made a wine list where users could reach the desired wine through inviting pictures. Beside, we gave priority to the presentation of the 3 wine region, thus they are accessable from either the items or the map where software immediately filters the related wines. The basic concept of the minimal design was that only the wine and wine region related sites were colorful, the structure is sparse and the product pictures are the largest possible sized. On the photo gallery users can explore the wine regions and also get familiar with the work process of wine making. 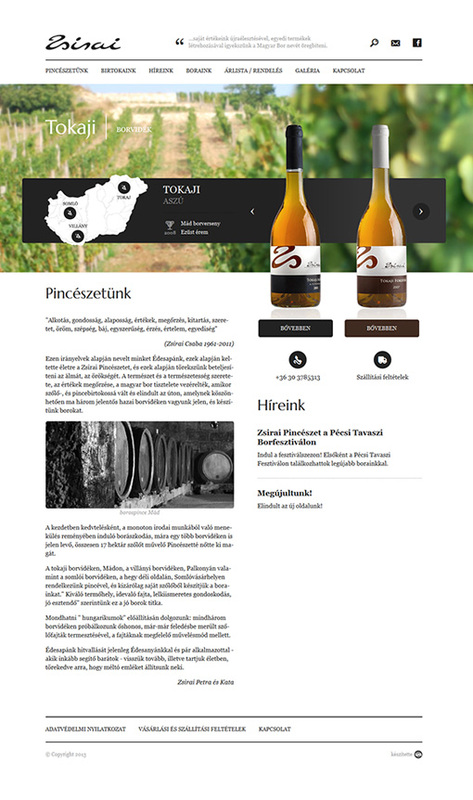 Beside the informationla contents, a simple webshop have been created where anyone can order the products of Zsirai Winery. The Gépszer Ltd. founden in 1996, who has more decades experiences in the machanic industry of technology because of predecessors. The result of its consistently implemented strategy they have continuous, repeated or occasional work in almost all the country's major industrial factory. The goal of Natur Agro Hungária Ltd. is to introduce an environmentally friendly, efficient technology to the hungarian agriculture. Their new website serves as a portfolio page, a portal, and a webshop at the same time. By the complex leaf analysis and the soil test, they provide a unique service in the country. In the case of this site, we faced a challenging project. We had to create a complex website with several functions and multiple permission levels for a very specific target group, wich is easily manageable and understandable. Therefore, we prepared every step particulary carefully. During the graphical shaping, we managed to create a pleasing athmosphere for the target group. We had to pay attention to the tiniest details, for example: next to the plow land, there are only tipical birds and trees of the area. We made the programming with a similiar care, because besides many function, we had to create softwares for the soil and leaf analysis based on so far manually used tables. 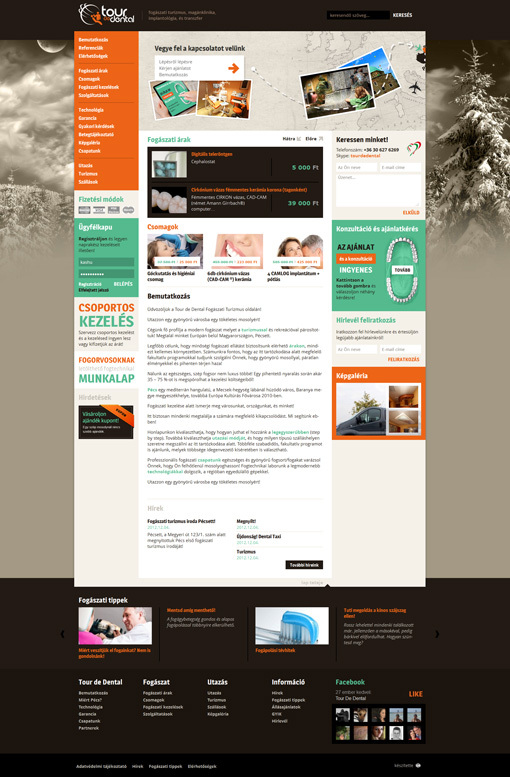 The final result is both graphically and functionally a unique website in the scene, where beside the information available for everyone, there are also conditional functions after multi-level registration, such as analysises nutrient calculators, webshop, downloads, forum, want-ads, loyalty system, online offer request, hand drawn animation. 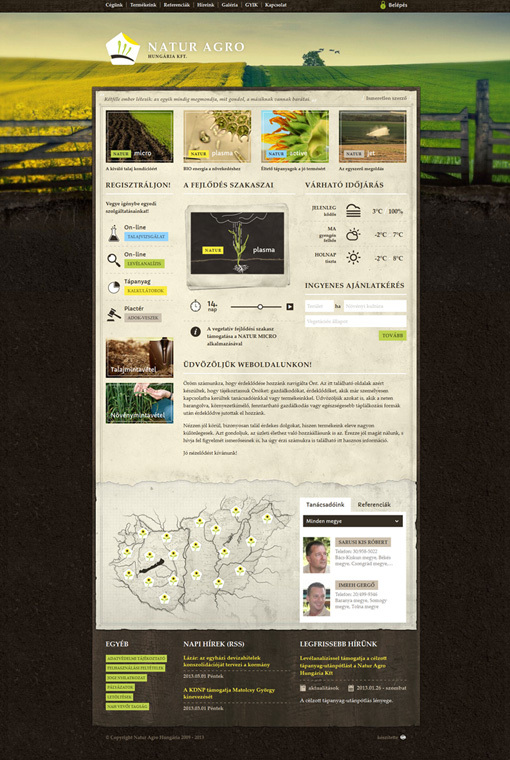 Webshop, online leaf analysis and soil test, calculators, loyalty system, etc. Tour de Dental is a website dealing with dental tourism. Its goal is to present the full full picture of a private practice in Pécs and its relatied services. In addition, the software provides plenty of support for future patients. When we create a website for a company with a complex service structure, it is always a serious task to find the right emphasis of the given topics, in this case: dental tourism, the private practice, implantology and the transfer services. We had to find the balance between the topics, that the goal of the website is clear at first sight. Since the target group of the services mainly consists midle-aged or elder people with dental issues, we decided to present the services and opportunities more than one way. Graphically, we focused on large letters and highlighting the letters with typography. 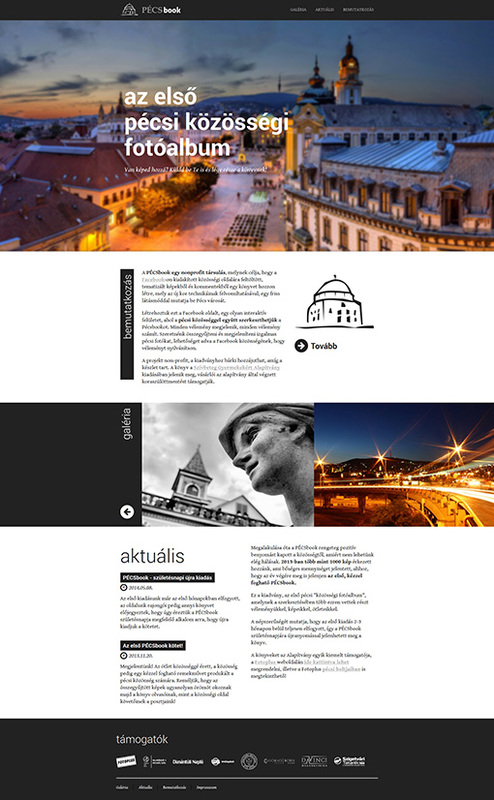 The completed website has a large slider wich navigates the visitor to Pécs and leads them to the important items. In addition we have created an inquirry form, where patients can choose services like in a webshop. We have also created more unique pages and a galery. Through the customer login, patients and contacts can easily communicate. 10 years have passed since the first webpage marked with a WB logo appeared. We have spent the elapsed time continuously developing our knowledge as well as creating enduring products in order to satisfy our clients’ needs on the internet market. Almost 200 finished projects, unique webpages, webshops and web applications can be found in our portfolio. Our greatest strength lies in our ability to create unique web pages. 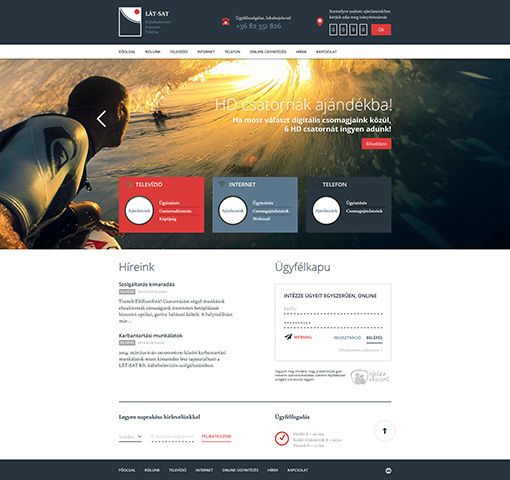 We are one of the few Hungarian web designer firms that care about any single project in a detailed manner. Our young and dynamic team is ready to realise even unique demands. Please, fill out the form at the right if you are interested in our works. You have to fill the email, and message field! Please fill in the email field with the correct e-mail adress!